Being engaged is the most exciting time of your life. The love of your life just proposed and you get to marry him! Yes!!! It's so exciting it's bringing a smile to my face right now. However, planning the wedding isn't quite as exhilarating. There are tons of things to think about that no one tells you. Here's the cold hard truth about wedding planning so you can be prepared. Ask the Guru -- My Bridesmaid Is Planning Her Wedding One Month After Mine! First thing to do here is to be a good friend and talk to her about it, because you don't want to carry bitterness into your wedding day. Secondly, tell her you'll understand if she can't be as involved and you hope she understands the same for you. She might be your fiancée, sister, best friend or daughter. You love her and want nothing but the best for her and her dream wedding. You were ecstatic when you found out she was engaged, but now, well let's just say when you see her number come up on your call display, a sense of dread washes over you. Every engaged gal fears being called the B-word. You know which one I'm talking about. When you're planning your wedding and things aren't going quite as you thought they would, it's actually not all that difficult to slip into the role of a bridezilla. We've all been there a time or two and it's not pretty. Wedding planning can be extremely stressful. Sometimes it takes on the tone of a family crisis, because many emotions arise during this time, and people put so many demands on the bride. Many chill brides might think a gift registry is too forward, but it really isn't! Trust me, as long as you include a variety of options and price ranges, your guests will appreciate not needing to rack their brains for the perfect gift, and you'll enjoy not receiving four blenders. You might never be a size 2 (or even a size 6 or 8). But if you make taking great care of yourself a priority, you're going to look and feel better, and that's going to fuel all kinds of positive changes in how you approach your life. I am that girl who started planning my wedding three years ago, on Pinterest, while I was dating someone else. Don't judge me, Judgey McJudgerson -- you know you did it too. Heck, you're probably doing it right now. Two days before my wedding, I was laying in the bathtub, crying because I felt bad about my body. "I am bad, I am wrong, I don't deserve the love of a great man, I don't deserve a spectacular wedding day," was the thought reel playing on loop in my head. Talking to my fiancé that night, something finally clicked. 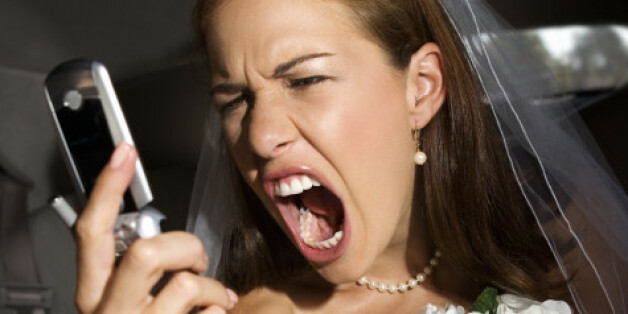 Can a Bridezilla be Tamed? Planning a wedding can be stressful, there are lots of decisions to make! It's impossible to make every decision at the same time, so it makes sense to break them down into areas. Focus on one thing at a time so you avoid overwhelm. Some claim that you don't see a person's true colors until you start planning your wedding. Most of the time dealing with all of the personalities is much harder than dealing with the actual planning itself. For some reason, I've found that weddings have a way of turning even the most mild-mannered, normal human beings into Gary Busey. Sometimes you're a guest at a wedding. Sometimes you're the server. On this particular night I was happily filling drinks, complimenting fashion choices and pointing to the bathrooms.